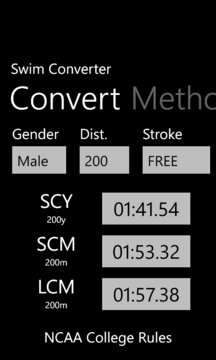 Swim Converter will convert swimming times between 25 SCY, 25 SCM and 50 LCM courses. Choose your method. We currently support 4 methods or formulas for conversion. Enter any one time and get the other two calculated for you. Our easy to enter interface makes it quick and intuitive! * Added Live Tile. Start Tile now shows last Conversion on Back Tile.